These GE Chest Freezers are Runaway Bestsellers! GE chest freezers are manufactured by industrial giant General Electric (GE). Why are these appliances such a household name? Because of General Electric's solid track record, GE is widely regarded as the best chest freezer brand on the market today. They are available in 7 sizes: 5.0, 7.0, 8.8, 14.8, 14.9, 19.9 and 24.9 cubic feet. If you are on a freezer hunt for a trusted brand, chances are that you’ll find the right model here. The feature set increases with the freezer capacity. While the smaller models are visibly minimalist in design, they get the essential job—of keeping your food frozen—remarkably well. The larger models don’t come with bells and whistles either. But they offer some beneficial features such as a lock and keys, power on indicator light and interior lighting. 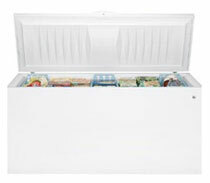 The 14.8 cu ft model is an Energy Star chest freezer. So if you are looking to rake in substantial energy savings while also protecting the environment, read on for the other benefits this energy efficient chest freezer offers. You can custom make the other benefits. 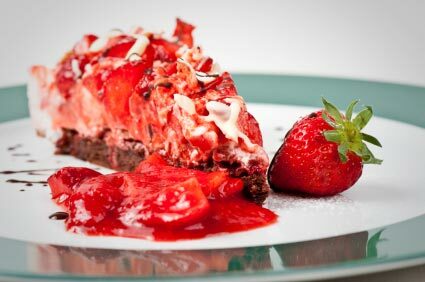 For example, does the power to surprise your loved ones with a delicious strawberry cake during winter appeal? Yummy! None of the GE chests is frost free and they all require to be manually defrosted if they are to continue to operate efficiently. However, essential quality, simplicity and GE’s solid reputation makes these models a pretty good buy. The 5.0 cu ft GE chest freezer (Model # FCM5SUWW) is the most compact chest freezer manufactured by General Electric. 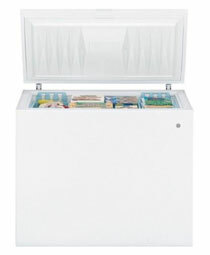 But it is also one of the bestselling chest freezers in its category. 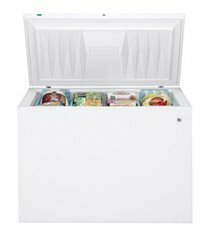 This freezer chest, which measures (WxHxD) 28 5/16 in x 33 1/4 in x 22 in, provides 5.0 cu ft of freezer space to help you store your perishables. Note though that you will, in addition, need to allow 3 in each for back air and side air clearances. The open lid also adds 20 inches to the stated height. A net weight of just 79 lb makes it easy to relocate upstairs, downstairs and back again without the risk of straining your back. A power "on" light lets you know the power status of your freezer at a glance. A storage basket—which can be moved around the unit via the rail grove or lifted our completely to create room for bulky items—helps you to organize your food quickly and neatly. A thermostat gives you the power to adjust the temperature of the freezer from time to time, depending on the optimal freezing conditions of the contents. This manual defrost GE chest freezer model comes with a defrost water drain. This eliminates the need to scoop out the waste water from the unit after the defrosting exercise is complete. Although this model is not Energy Star qualified, it only consumes 240kWh of energy each year. This is estimated to cost $26 per year, or a measly $2.17 each month. Its simple design and modest set of features makes it easy to operate without constantly referring to the manual. Plus, it is proof that General Electric has concentrated its R&D budget and efforts in promoting the core functions of the freezer. You can therefore invest in this model, confident that it will keep your food frozen rock solid. The white cabinet is easy to keep clean while the recessed handle both lends a stylish look to the model but also makes it a space saver. No need to worry about how an awkwardly protruding handle will fit in your tiny kitchen or how to avoid tripping over it. This model operates very quietly and won’t be a source of noise pollution in your home. This is thanks to the robust cabinet and lid insulation plus wraps around both the evaporator and condenser. The appliance comes with a 1 year limited warranty for parts and labor. In other words, should your unit fail during the first year due to defective parts or bad workmanship, General Electric will remedy the flaws. The 7.0 cu ft GE chest freezer (Model # FCM7SUWW) is the second smallest GE chest freezer. Because it provides 40% more freezer space yet it costs only 8.7% more, it is a fast mover and consistently receives rave reviews from its owners. 7.0 cu ft of freezer space packed in a cabinet whose approximate dimensions (WxHxD) are 37 in x 33 1/4 in x 22 in. However, when measuring the freezer space, remember to allow for an additional 3 inches at the back and sides in order to allow for sufficient airflow. Opening the lid properly will also require an additional 20 inches to the indicated height. It weighs only 91 lb, making is relatively easy to relocate around the house. A power indicator light will let you know the power status of your freezer with a quick glimpse. As such, you don’t have to plug your ear to the freezer to hear whether it is still humming. Energy consumption stands at 277 kWh per year. This is estimated to cost only $30 per year, or just $2.50 every month. This GE chest freezer model comes, not with 1, but 2 storage baskets. So you have double the food organization capabilities of the 5.0 chest freezer. A level of rail makes moving the food-laden baskets around the unit easy. This makes food organization a snap. The adjustable temperature control gives you the power to set and adjust the temperature of your frozen food as needed. A convenient defrost water drain is included to make manual defrosting easier. This, thankfully, eliminates the need to lift or tilt the unit in order to direct the waste water out of the unit. So, in many ways, the drain is a back saver. The model is manufactured in white, a color we have all come to associate with many kitchen appliances. So, if it isn't a freezer unless it is white, you're in luck! A recessed handle gives the unit am ultra modern look. It also means that the freezer will fit in the tightest of spots. This is one of the quieter chest freezers available today. Its rigorous design, that includes lid and cabinet insulation and foam wraps around the condenser and evaporator, is sure to add a touch of serenity to your home. The appliance comes with a 1 year limited warranty for parts and labor. Therefore, in the unlikely event that your unit malfunctions within this period due to defective parts or bad workmanship, the manufacturer will repair it free of charge. The 8.8 cu ft GE freezer chest (Model # FCM9DTWH) is a great option if you find the 7.0 cu ft model a tad too small. And, it is the smallest lockable GE chest freezer. As you will see in a minute, it's a literal lightweight. 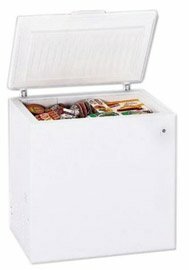 This GE small chest freezer offers 8.8 cu ft of freezer space in a cabinet whose dimensions (WxHxD) are 34 1/5 in x 41 in x 23 1/4 in. Note though that in addition, this freezer will require back and side air clearances of 3 inches each. Plus, the open lid adds about 20 inches to the stated height. Its net weight is 124 lb while its approximate shipping weight is 140 lb. This GE freezer consumes 294 kWh each year. This translates to an annual cost of $31 each year, working out to a monthly bill of $2.58. The lock and keys serve a dual role. They keep your little ones out of the freezer and also out of harm's way. Plus, they keep your cherished frozen items out of the reach of pilfering relatives and neighbors. A power "on" indicator light lets you know the power status of your unit with a quick look. This GE freezer's bright interior lighting is especially handy for loading your freezer and retrieving items. This will especially be appreciated if you plan to place your freezer in a dimly-lit room. The adjustable temperature control gives you the power to adjust the temperature of your frozen food from time to time. 2 storage baskets are ideal for storing small or frequently used items such as green peas that would otherwise lie buried at the bottom of the freezer. What’s more, these baskets can be removed from the freezer completely in order to make room for oddly shaped items. A level of railing facilitates food organization and makes moving heavy storage baskets around the unit—in order to access the items that lie below—a breeze. A defrost water drain is convenient and helps to take the strain out of manually defrosting your unit. Every chest freezer must be defrosted every so often as ice buildup causes the freezer to consume a lot more energy, thereby needlessly running up your electric bill. Because this GE chest freezer cabinet and lid are insulated with foam and there are wraps around the condenser and evaporator, it operates quietly and will not disturb the cherished tranquility of your home. The 14.8 cu ft GE chest freezer (Model # FCM15PUWW) is the darling of many cost and environment-conscious consumers. This is because, as the only certified GE energy efficient chest freezer, it delivers considerable energy savings while also helping to conserve the environment. This is one of the popular energy star chest freezers on the market. It uses 357 kWh of energy each year. This translates to an energy cost of $38 each year or just $3.17 per month. As such, this model is 50% cheaper to operate than similarly sized chest freezers. So, if you are looking to lower your energy costs while doing your bit to conserve our delicate environment, you should consider investing in this model. 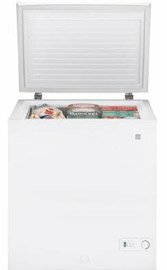 It offers 14.8 cu ft of freezing space, making it an ideal size for medium size families. Approximate dimensions (WxHxD) of 48 in x 35 in x 29 1/2 in mean that you don’t have to live in a mansion to enjoy this chest freezer’s offerings as it will fit in many townhouses. Nevertheless, when measuring the area where you plan to site this model, be sure to allow for 3 inches back and side air flow and an additional 26 inches to the height in order to allow the lid to open properly. A lock and keys enable you to control who accesses this GE chest freezer. As such, it is good place to store your valuable perishables especially if you can't vouch for integrity the high human traffic that it is exposed to. A power "on" light lets you know whether the freezer unit is connected to power, enabling you to take corrective steps to avert food spoilage. Adjustable temperature control puts you in charge of controlling the temperature of your frozen food. Turn it up or down several notches according to the food that you are freezing. 4 lift-out/ sliding baskets make it easy to organize your food and store small items that would otherwise be difficult to find if all the storage space was cavernous. 2 levels of rail facilitate food organization and moving the baskets around, saving you from unnecessary muscle strains. Bright interior lighting facilitates meal planning. You are therefore able to quickly retrieve meat for thawing the night before you plan to cook it. This in turn eliminates the need to use a microwave, which discolors the meat and makes it less tasty but also consumes a lot of energy. The defrost drain reduces the tedium of manually defrosting this GE chest freezer model, an exercise which must be carried out every couple of months when the ice has built up to about 3 inches thick. Foam insulation in the cabinet and lid conserves energy and helps the food remain frozen for longer during power outages. This model is a great buy if you leave in a hurricane-prone area. Because there is wrapping around the condenser and evaporator, the freezer operates quietly. Therefore, it won't intrude on your home's peace and quiet. This model comes with a 1 year limited warranty on parts and labor. As such, any product malfunctions emanating from defective parts and poor workmanship that become evident within the first 12 months will be remedied free of charge. 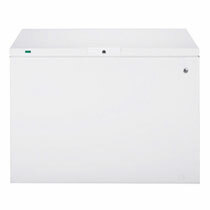 The GE 14.9 chest freezer (Model # FCM15SUWW) is only slightly larger than the 14.8 cu ft chest freezer. 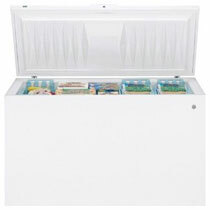 Its 14.9 cu ft of freezing space making it a great time and money saver for medium size families. With ballpark dimensions (WxHxD) of just 48 in x 35 in x 29 1/2 in, you don’t have to live in a lavish villa in order to enjoy this GE chest freezer’s offerings as it will fit in many condominiums. Nevertheless, when measuring the area where you plan to locate your unit, remember to add an additional 3 inches for back and side air clearance. Also be sure to allow for an additional 26 inches to the headroom in order to allow the lid to open properly. 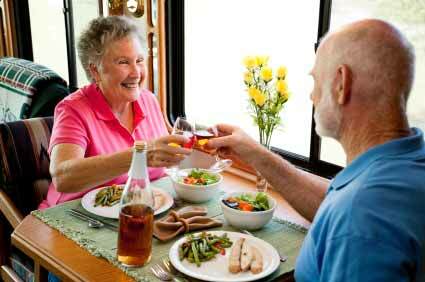 A lock and keys enable you to discourage, or deter theft of your precious perishables. They are also a great way to make your freezer off limits to your children. This in turn helps to prevent household accidents. A power "on" light lets you know, at a glance, whether your freezer is properly receiving power. If it isn’t, you are able to take corrective measures to prevent food wastage by restoring power supply. An adjustable temperature control lets you set and adjust the temperature of your frozen food as frequently as you wish. An incredible 5 lift-out/ sliding baskets make it easy to organize your food and store small items that would otherwise lie unnoticed at the bottom of the freezer. 2 levels of rail make it easy to move the baskets around without the need for manual lifting that could cause unnecessary bodily injuries. Bright interior lighting makes it easy to freeze and retrieve food. This feature is especially important if you plan to locate your freezer chest in a dimly lit room. The defrost drain reduces the stress associated with manually defrosting your freezer. Foam insulation in the cabinet and lid conserves energy and helps the food to stay frozen for longer during power blackouts. This freezer operates quietly, thanks to the wrapping around the condenser and evaporator. General Electric stand behind this product by offering a 1 year limited warranty on parts and labor. As such, any unlikely issues resulting from manufacturer use of defective parts and poor workmanship that become apparent within 12 months will be remedied at no extra cost to you. The GE 19.9 cu ft model # FCM20SUWW is one of the popular large chest freezers available today. 19.9 cu ft of freezer space are packaged in a cabinet whose dimensions (WxHxD) are approximately 61 1/4 in x 35 in x 29 1/2 in. However, when measuring the area where you plan to site the chest freezer, be sure to factor in 3 inches for back and side clearances for air flow. You will also need to add 26 inches to the stated height in order to allow the lid to open fully. This enormous storage capacity pays huge dividends, enabling you to shop in bulk, saving you money. This GE chest freezer model comes with a lock and keys to enable you to keep your children's inquisitive hands, and unauthorized persons out. A power "on" indicator light alerts you to the power status of the freezer, enabling you to take remedial action in order to prevent wastage of hundreds of dollars worth of food. 5 lift-out and sliding baskets make storing and locating food easier. 2 railing levels facilitate food organization and make it easy to shuffle these storage baskets around. Bright interior lighting makes finding and retrieving food in the freezer easier, especially in rooms that are not well-lit. An adjustable temperature control lets you determine and adjust the temperature of your food as needed. A defrost water drain and drain pan/divider are conveniently included to make manual defrosting this GE chest freezer easier as there is no water mess to clean up afterwards. The cabinet liner is coated with steel epoxy for extra strength and durability, assuring you of many years of dependable service. Thanks to the wrapping around both evaporator and condenser, this freezer operates quietly. Because freezing cycles don't start with a literal bang, you can look forward to retaining a noise-free environment. Foam insulation in the cabinet and lid conserves energy and helps the food remain frozen longer during power outages. With energy consumption of 568 kWh each year, this isn't exactly an energy efficient freezer. Thankfully, this only costs about $61, translating to only a little more than $5.00 each month. This is however more than offset by the considerable bulk purchase savings raked in, courtesy of this freezer. With the standard 1 year limited warranty on parts and labor that this model comes with, you can rest assured that defective parts and poor workmanship will be remedied free of charge. As the largest of all GE chest freezers, this mammoth unit measuring (WxHxD) 73 1/4 in x 35 in x 29 1/2 provides enough space to store a large family's frozen food needs. Its white grainy steel finish, matching handle and conveniently located features give it a stylish look that makes it an enviable addition to any large kitchen. This 25 cu ft chest freezer pays for itself in no time. This is because it empowers large families to shop in bulk or stock up on discounted products. It is also a great time saver as it enables you to shop less frequently and also to engage in once a month freezer cooking. The model comes with a lock and keys. This enables you to secure your hard earned food investments by controlling who accesses them. A power "on" indicator light confirms, at a glance, the power status of the freezer. It accordingly reduces the incidence of food spoilage resulting from loss of power to the freezer unit. Adjustable temperature control lets you determine the temperature of your food with as much mechanical precision as can be. 5 storage baskets which lift out completely are indispensable for storing and locating tiny items—such as a tiny packet of diced carrots—in this gigantic deep freezer. 2 levels of railing mean that storage baskets can be positioned either higher or lower in the freezer, facilitating organization of frozen items. The railing also enables you to mechanize the movement of baskets around the unit and therefore prevent needless injuries. Enhanced interior light simplifies searching for food in the freezer particularly in rooms that do not have enough natural light. A defrost water drain and drain pan/divider are thoughtfully included and are handy for manually defrosting your unit. The cabinet liner is coated with steel epoxy for extra strength and durability. So you should, typically, look forward to more than a decade of reliable service. The freezer is quiet, owing to wrapping around both the evaporator and condenser. Foam insulation in the cabinet and lid conserves energy and helps the food to remain frozen solid for days following a power outage. This model comes with a 1 year limited warranty on parts and labor. As such, any malfunctions that occur in this GE chest freezer within the first 12 months of purchase will be remedied at the manufacturer’s expense.